Thanks to Dana and Assem for a delightful performance. I mentioned last week the upcoming Short + Sweet 10 minute play festival. It is a delight to me that this festival has arrived in town and given a bunch of Drama Groups in Dubai an opportunity to share dressing rooms with each other for a couple of weeks. Sadly, the Love and Light of my Life's play did not make the finals. We are jointly understandably crushed and would seriously consider boycotting the whole festival except that if we did that we would miss out on lots of lovely theatre. IT IS SUCH A DILEMMA. I was, as always, nervous of what would be on offer especially considering that many of the Plays would have locally written scripts. 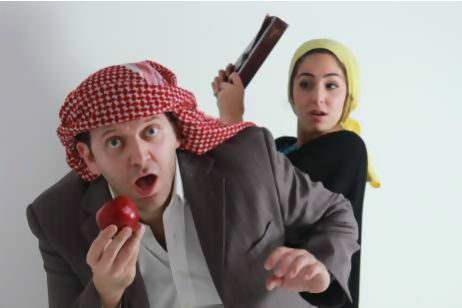 I have been to some of the earlier Dubai Drama Groups productions of locally written plays and am delighted to say that from the first time I first started going to the New Developments showcases to this festival there has been a very pleasing improvement in the quality of what is being produced. I think a big shout out should go to the Dubai Drama Group who run the New Developments play writing competition. I believe that their initiative over the past few years has greatly contributed to the quality of locally written material. I will definitely watch out for this years New Directions which was postponed to allow for their members and contributors to take place in this Festival. YAY more theatre coming up this year! My favourite so far was Dana Dajani's "Yeki Bood / Yeki Na Bood" which she performed with Assem Kroma. I don't speak a word of Arabic but they conveyed the meaning of what was happening to the audience so well that I am sure I know exactly what what they were feelings and thinking. It was a delight. Sadly I think this play is out of the running, mores the pity. But never fear there is still plenty to see coming up in the next few days culminating in the Short+sweet finals. For those of you who have been savvy enough to get down to DUCTAC and see what has been on offer - well done you! The rest of you get down for Wild Cards 3 on Friday 1st March and don't forget to catch finals on Saturday. You will see me there, skulking about, trying not to enjoy myself too much.